Jointing bench or shooting bench as English translation of skottbenk? As a blogger I want to know my readers and get some feedback from them. Our readers have mostly been norwegian, swedish and danish as they understand the Norwegian language. The last few days there have been an encreasing number of readers from USA, Belgium, Canada, UK, Portugal and Germany. This might be coused by a post on the blog, A Woodworker`s Musings that led the readers to both this blog and a related blog, Høvelbenk. There was also some traffic from a internet forum for workbench questions. For us it is very interesting to know if there are similar workbenches as the «Skottbenk» in other countries. Please comment on this post if you have any information. The Norwegian word «skottbenk» could translate to shooting bench as it works a similar way as a shooting board or a sticking board. It is used for jointing and squaring boards and planks, usually long boards. There are some patents of such benches at the United States Patent and Trademark Office, some of them are presented in an earlier post. One of theese benches are called a Joiners bench «with improvement for Jointing and Squaring boards and lumber». We could also translate «skottbenk» to «jointing bench». There are also other terms in Norwegian to describe theese benches. The word «rettbenk» could translate to «straight bench». The word «strykebenk» are both used to describe a «skottbenk» but are also the name for the coopers long jointing plane. The «skottbenk» are used to hold the board when you work the edge with some special handplanes with depth stops (named «meie» that means skid) on both sides. The top of the long straight bords on the «skottbenk» works as guides for theese depth stops. There are planes just for jointing and are named «skottokse», and there are plows for flooring or panels. I have seen this system of work in Norway, Sweden and Denmark. The patented bences from USA indicate that something similar are known there to? There is also a drawing made by Leonardo da Vinci that shows a similar workbench. The last one is so complicated that it has been called a «planing machine», but it works a similar way as a «skottbenk». If you know something about similar benches in other countries, please comment on this post. The tools in your part of the world are so different from the USA so I find your blog very interesting. I have seen pictures of the shooting bench on-line but could not understand what they were used for due to language barriers. The bench with the special plane is brilliant! Thanks for translating! Thank you for your comment. The tools and skottbenk (shooting bench) are very good for some kinds of work. I belive there is more like this around the world. When woodworkers starts to search there will be more. 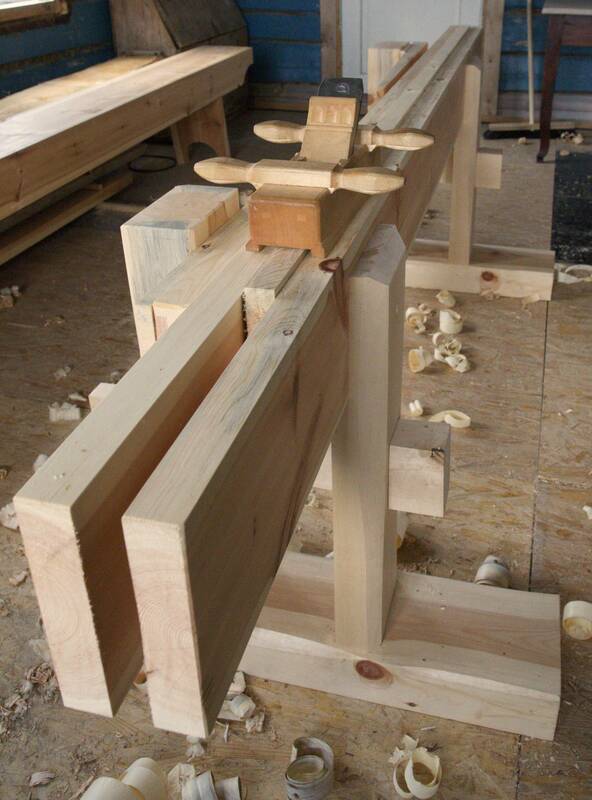 The method of using a wooden plane with side depth stops is a good idea but how is the work piece held. I can’t see any clamping device? I do not know what kind of timber you can find in UK? Here in Norway I get my timber at local sawmills and season the timber myself. I could also buy construction grade timber and make this bench from that. 2″ by 4″ would be ok to glue together for the larger pieces. For some pieces a 2″ by 6″ would do. For the long boards it is important to find some nice 2″ by 8″ that are not twisted. You could compensate for some twisting by splitting the boards and glue them together. That could also make them more stable. The edge that are up should not have knots that make problems when you are shooting the top straight. I am interested in getting the measurements and diagrams of this skottbenk so I can make a 3D SketchUp file for everyone. If anyone has those plans please let me know. Hi Roald, I also re-blogged this on http://www.hackneytools.com. Hope that’s ok. I think this bench is a fantastic idea and plan to make one. My only question is where can I buy these planes? Hi Gary, I am glad you find this interesting and want to reblogg from my blog. I am sorry to say that theese planes are not easy to find. The standard plane, the skottokse, could easily be made from an old plane that you mount some wood strips on. You could use a fore plane for this, you would not get the special handles for two men unless you modify the plane a lot. This is in Norwegian but you might have some luck using google translate (use google crome browser). We do have some workshops in planemaking here in Norway from time to time. It is ok to start to make an okshøvel, the standard two man plane as the first you make. I would like to se that some of the planemakers in Norway would like to make theese kind of planes for sale. It is a bit early for that now but it might be later? I almost had an urge to make a plan for the planes in 3D, but figured out that would require a huge effort and I would probably need to have one in my hands so I could get the full measure of the skottokse and make it properly. Not really able to be that precise from drawings or pictures/diagrams.